The status of Kashmir is an age-old debate in international politics. Recently, the Pakistani Government’s plans to change Gilgit Baltistan’s constitutional status and make it the country’s fifth province emerged. According to the letter by Prime Minister Nawaz Sharif, the government postponed the plan following international pressure. Under pressure, Pakistan has apparently shelved the idea of annexing Gilgit-Baltistan (GB) from Pakistan Occupied Kashmir (PoK) to make it country's fifth province. In a letter to Jammu and Kashmir Liberation Front (JKLF) chairman Mohammad Yasin Malik, Pakistani Prime Minister Nawaz Sharif has ruled out any change in the constitutional status of Gilgit Baltistan (GB). "I appreciate your views on the impact of any possible change in the constitutional status of GB on the Kashmir cause. Your concerns and suggestions are valuable and are being examined with meticulous care… I would like to make it unambiguously clear that Pakistan is fully aware of the sensitivities attached to Gilgit-Baltistan with regard to Jammu and Kashmir dispute," Sharif said in his letter. The letter comes in response to the communiqué sent by Malik to Pakistan premier in January raising fears over the moves to merge Gilgit Baltistan with Pakistan. "This will have implications on the dispute over Jammu and Kashmir. If Pakistan imposes its sovereign writ over Gilgit Baltistan, India will then have a political and moral right to integrate Kashmir with it," Malik wrote to Sharif. Previously known as Northern Areas, the GB had been part of erstwhile princely state of Jammu and Kashmir. 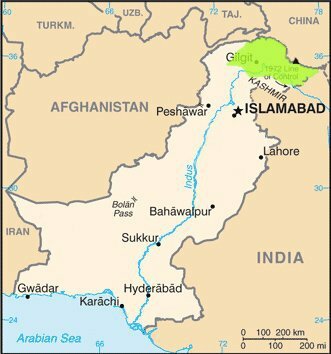 However in 1970, GB was made separate administrative entity, the arrangement which remained until 2009 when it was made self governing territory of Pakistan with separate Legislative Assembly and the chief minister. "I would like to assure you that Pakistan will never compromise on its principled stance on Jammu and Kashmir dispute, which is based on UN Security Council resolutions. Nor will Pakistan take any measure that may cause harm to the valiant struggle of the people," said Sharif. Jammu and Kashmir Liberation Front expressed satisfaction over the assurances given by Sharif to uphold the constitutional status of GB. "We hope that there will be no change in GB status because there is letter from Prime Minister in this regard," GR Eidi, general secretary of JKLF told dna. The ruling Peoples Democratic Party (PDP) said Jammu and Kashmir is one unit and it should remain so. "It is now an official commitment that PoK will remain one unit and they don't want to make it fifth or sixth province," said Dr Mehboob Beg, chief spokesman of PDP. BJP, however, said whole of PoK is an integral part of India and any kind of violation by Pakistan will not be accepted. "People of PoK are being oppressed by the Pakistani might. PoK is an integral part of India," said Khalid Jehangir, spokesman of BJP for Kashmir. Main opposition party the National Conference (NC) said internal autonomy is the political solution because the borders cannot be redrawn. "We do not think borders can be redrawn. Any solution which is acceptable to both countries primary to people of J&K is a viable solution," said Junaid Mattu, spokesman of the NC.